After working for more than 3 months with admitad, I can say admitad is one of the best Cost Per Action (CPA) based affiliate networks on internet right now. admitad connects publishers and advertisers in a more symbiotic kind of relationship making mutually beneficial to each other. On the one hand, as a publisher you get to choose some of the best brands to promote and earn huge commission on each sale or leads. On the other hand, advertisers don’t have to worry about their advertising needs because admitad offers reliable sources of sales and new business models to ensure monetization of publishers’ traffic. admitad was established in 2009 in Germany by Alexander Bachmann. The official launch was in 2010. In such a short time period admitad has being able to establish itself as a global company with a presence in countries as Germany, China, Russia, India, Ukraine, and Belorussia. In 2010, admitad started with just 10 employees, now it has more than 270 employees working in the admitad offices across the globe. You can imagine since 2010, company has grown exponentially. In fact, this meteoric rise of admitad has convinced publishers like me to join this particular affiliate program over others. What fascinated me about admitad is its founder. Alexander Bachmann, the founder and CEO of admitad has been working online since the age of 15. Started as a publisher, Alexander soon became one of the top 10 publishers in Germany and soon, at the age of 17 founded his business admitad. He built his company from the ground up, now Bachmann is helping young businesses in IT and Digital spheres to develop with the help of the admitad Investment Fund. This fund gives them money to start and develop progressive projects. But, what I liked the most about this man is, he is so dedicated to support publishers that he created a special online academia where publishers like me, can learn and develop our skills to earn thousands of dollars each month via CPA marketing. This is another great reason for publishers to join admitad. My conscience is very much clear that admitad is a transparent affiliate network because I’ve been making money from this CPA network since 2014. However, new affiliate marketers who are curious about admitad would like to learn more about this network. Since 2010, admitad has proven its reputation for being transparent and publisher friendly network. 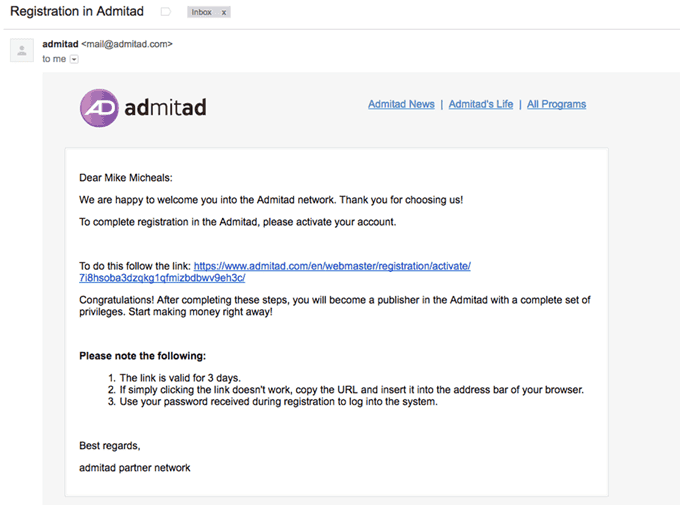 As a publisher, I can testify why admitad is one of the best affiliate networks online to join. Read the following paragraph to learn why admitad is the best. Already almost 600,000 publishers worldwide are associated with admitad. You can’t have over half a million publishers making money with admitad without any trust. So this is obvious, that admitad provides good working conditions for traffic monetization and growth. As you will read later, admitad will support you during your entire CPA marketing journey. So they are for real. Not just publishers, but advertisers also trust admitad. Right now, admitad has over 1500 affiliate programs to choose from. Publishers can also directly contact advertisers and negotiate terms with them. admitad offers most competitive commission rates among other affiliate networks. The threshold payment amount is very low at just $20. Unlike many other affiliate networks where threshold income is usually $100. You don’t have to worry about payments because they will pay you through PayPal, e-payments and direct wire transfer on time. Usually novice publishers have a difficult time adjusting to a new User Interface of an affiliate program. But admitad’s UI is very intuitive and a newbie can learn very easily. You can access all the information right from your dashboard. They will give publishers on-time statistical and analytical reports helping them make more profits. I hope this is enough to convince you that admitad is indeed a reliable affiliate network. But if you still have doubts then read following paragraphs for real proofs with screenshots. Here I’m going to show you the entire sign up process step by step. The entire sign up process is so hassle free that it just takes 4 steps to complete it. You click “Continue sign-up” and move on to Step 2. Here you create an ad space. Click “Continue sign-up” and move on to 3rd step. You are almost done. You just have to go to your inbox and click on the activation link. After clicking the activation link you will get Congratulations message. Here you paste the code in your website and just click on “Done, check it” button. 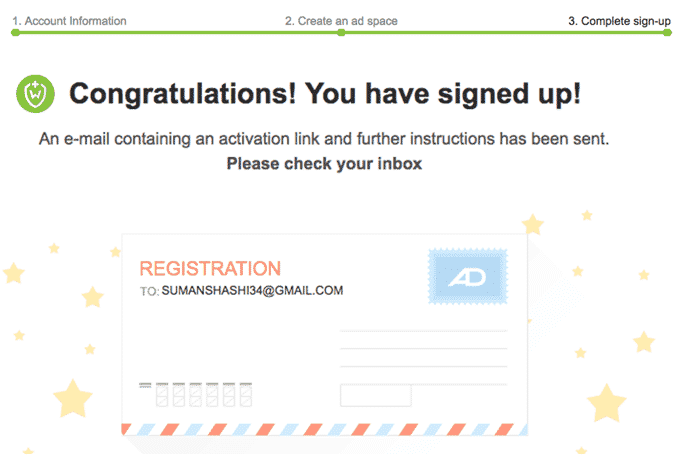 You are done with entire Sign Up process of admitad. And now you can move on to exploring advertisers. As I said earlier, at admitad, there are over 1500 advertisers to choose from. And out of 1500 there are over 140 exclusive advertisers that publishers won’t find in other affiliate networks like Commission Junction (CJ) or ClickBank. Here is the list of some of the top brands categories that publishers can promote. The most abundant top brands that you can promote fall in online shopping categories. Shopping site can easily generate huge traffic coming onto your website and helping you sell products for various shopping sites mentioned below. I promoted few of them in the list. BarkBox – Americans love their pets and you definitely sell something to them. Shein – Sell Clothing and Shoes and earn huge commission. Travel is second best categories to promote from. Beauty category is just like Online shopping where you get lots of traffic in short time. To be honest I’m actually earning my most of the commission from this category and not from online shopping or travel. RentalCars.com – I personally don’t use but brand is very popular. Last major category is Online Games. So these were 14 top brands from different categories. There are even more if you visit admitad’s program section and select the Region as US. You can choose any brand to promote depending on the niche of your website. As I said earlier, right now I’m promoting Wix’s product and making thousands of dollars each month. However, if you are a new publisher then you must try admitad exclusive programs that other affiliate networks do not have. You can easily beat the competition by promoting admitad exclusive programs. Here, are some of their most exclusive programs present nowhere else. As a novice publisher I would recommend you the start your career with admitad exclusive programs. Choosing an admitad offer to promote is an art. You learn this art after years of experience in affiliate marketing. I promoted products from other affiliate networks like CJ, Amazon, MaxBounty, FlexOffers etc. So I have quite an experience with choosing an offer to promote. You can trust me, admitad offers are easiest and simplest to choose from. Their user interface makes it very easy to choose an offer even if you are a newbie. Here is how I choose an offer. On the left hand side of your screen you can choose US from the drop down list for the field “Sales Region”. Then for Action Type You can choose between “sale” or “lead” option. I choose “Sale” option. If you want to earn commission with “Lead” then choose it. As I said earlier, admitad exclusive programs are the best choice to promote especially if you are a beginner. So, Check the Exclusive Program box. In Advertiser category I choose Online Services. But if you want to promote Online Shopping or Travel products then go for it. As a beginner you can leave last two options “Traffic Source” and “Tools” because these are for more experienced marketers. Once you are done with filtering you get the final list of offers that you would like to promote. Now you can further sort the list to choose offers that are relevant and going to pay huge commission. On the right hand side of your screen choose options from “Sort by rating” dropdown button. I consider three criteria very important. Here is the order of importance. Number 1 is sorting by CR or Conversion Rate. CR is very important because conversions matter not visits. CR must be above 50%. Number 2 is by eCPC or Click Per Click. How much commission you make. Choose offers with higher eCPC. Number 3 is by Rating. After going through all the sorting options you can finally choose two to three offers and start promoting. For me, entire process for choosing offers on admitad platform was a hassle-free experience. I loved it when I joined this network because its User Interface was so simple and easy to navigate. It will not take more than 15 minutes to choose one of the best offers. You are not going to sell or generate leads if you don’t receive traffic to your blog. Hence, for promoting products you need to learn various strategies. Over the years, I experimented with so many promotional strategies but only two to three strategies are really going to work once you start promoting. More than 70% of your traffic is going to come from organic search. Hence, Search Engine Optimization or SEO is the most important strategy that you need to implement. Ranking high on the first page of Google should be your first priority. SEO matters even more if you are a new publisher because email marketing or PPC is for more experienced marketers. Remaining 20% of traffic will come through Email marketing. If you have a database of people with names and email addresses, then you sell them directly through emails. Remaining 10% is through social media platforms like YouTube, Facebook, Twitter etc. So, these three promotional strategies that you need to focus on. admitad is actively developing in influence marketing. Since 2016 YouTube marketing has become an integral part of the effective admitad toolkit. Affiliate marketers are always looking for support from their affiliate network. As an affiliate marketer myself, I know how a little help from the network can increase your profits 4 folds. The good news is admitad never disappoints you when it comes to mentorship and providing help to their publishers. When I was promoting admitad offers I got all the support I needed from their team. admitad offers a dedicated representative who will handle all your questions and concerns. The representative will work personally with you and will negotiate with advertisers on your behalf. If you have issues promoting a particular brand, then you can talk directly with an advertiser and admitad representative during a trilateral meeting and sort things out. admitad brings publishers, advertisers and its managers together at one platform. Publishers, like me, get a chance to meet advertisers personally during admitad affiliate events or to set a trilateral meeting with their admitad manager. Thus, both publishers and advertisers can negotiate exclusive terms to get a better deal. You also get help and mentorship on attracting targeted traffic on the CPA scheme provided by admitad Team members. admitad leaves no stone unturned when it comes to helping Publishers. admitad offers a wide variety of tools to publishers that can help them increasing their profit margins. I didn’t use all of the above mentioned tools but I did use few of them to drive traffic on admitad offers. For example, Coupons and Deals tool really helped me to attract a lot of visitors to my online shopping site which sells all kinds of products. 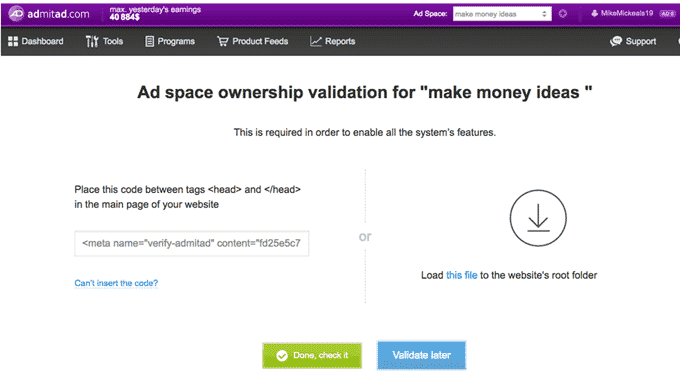 I automated the entire couponing process for my website with this tool. I also used Link Checker to get targeted traffic on my sales page and to avoid errors. The third tool that I used was Cookie Checker and it helped me to recover my lost conversions up to 25%. It means that with Cookie Checker I made over25% profit. How Much Money Can You Make with admitad Offers? Now I am going to show you some real income for the last month that publishers are being able to generate from admitad program only. I will be sharing income proofs of two such publishers. First one is my income with affiliate and another from one of my friend who is a super affiliate. In this article, I could have shared my income only and not of my super affiliate friend. But it was necessary to share his income also because I wanted to motivate you to try driving traffic on admitad offers and to give an idea on how much potential admitad has when it comes to making money online. So here is the screenshot of income generated by my super affiliate friend for the last month with admitad. If you are having a problem understanding the above screenshot then I will make it whole data simpler for you. So just take a look at the income generated by him for the 6 important days in the month. The figures given above in the table shows how much my publisher friend made with admitad program. For six days, he made $4,250 approx. each day. So according to the data, for the whole 30 days period from 1st September through 29th September he was able to earn above $125,000. On an average, in one day he made $4000+. Right now he is earning $120,000 – $130,000 per month depending upon the traffic he receives on a given day. For now, my friend is focusing only on admitad program. The reason to give above proof is not to show that every publisher can make this much amount of money each month. But to inspire you to get started. Here is my admitad’s income proof for the last three months. You can clearly make out from the image that my income comes nowhere close to my friend’s. I made only $10,000+ in last three months. So, on an average for one month I earned some $3500. But this is not my main source of income. I am making much more from other sources. You can find more about me here. But I’m aiming to reach 6 figures monthly income from admitad just like him in coming days. Because I believe if my friend can do it then I can do it too and if I can do it then so can you and other publishers. How Did He/I Generate So Much Traffic? I know above screenshots and the data are going to blow your mind away. But this is for real! Combination of right kind of marketing strategies and great affiliate network like admitad can really make this possible. Earning around $120,000+ per month is not possible unless you leverage all the marketing strategies up your sleeves. In a party held few months back, my friend told me some of his strategies for earning $125,000 monthly with admitad. Following are the strategies that I and my super affiliate friend employed to generate leads and converting those leads into sales. As an affiliate marketer, we employed 4 tried and tested strategies to earn this income. 80% of your traffic is going to come from Google. So you have to focus on SEO. Target right keywords in your niche and optimize your website. You must be present on the first 3 spot of the first page of the Google search result for a particular keyword. Even a new publisher can do this! Email marketing is for more experienced publishers who have been collecting email address of their readers for years now. I personally use Aweber to collect name and email address of visitors coming to my website. You can email a sales letter with a link to your website to thousands of people in your database. Use power of Facebook and Twitter to get even more traffic. Build an army of followers around you and bring them to your website. I personally use Google AdWords PPC program to drive even more traffic. However, AdWords is not free and I will not recommend this to new publishers. So just follow, first 3 strategies especially SEO. Getting traffic to your website is just job half done. Other half is converting leads into prospects. According to my personal experience I will recommend you to focus on just two things. First is, creating a powerful landing page that is going to convince readers into buying something. Most of the affiliate marketers go wrong when it comes to creating landing pages. You will convert your leads into customers only when you know art of persuasion. Your landing page must be able to captivate hearts and minds of readers till the end of the page. Call-to-action is the key here. Either you can write the sales page on your own or hire an experienced copywriter. I wrote for myself. If you can’t then look for a copywriter! My friend hired one. Usually new publishers don’t get it right when it comes to placing referral links at the right place in their sales page. As rule of thumb, always place your admitad referral links at the end of the page while asking your readers to take action. You can’t place a referral link anywhere in your blog. First you have to convince readers from start till end, and when they have made their mind to take action, you need to finally present them with the referral link. I’m pretty much sure that the above statistics about our income is going to convince you to join admitad program. To be honest my whole experience with the admitad network was quite pleasant. I’ve been able to make nice amount of money promoting admitad offers. admitad made choosing a right kind of offer to promote really easy for me. I was able to choose few right offers quickly and started promoting them within matter of few hours. 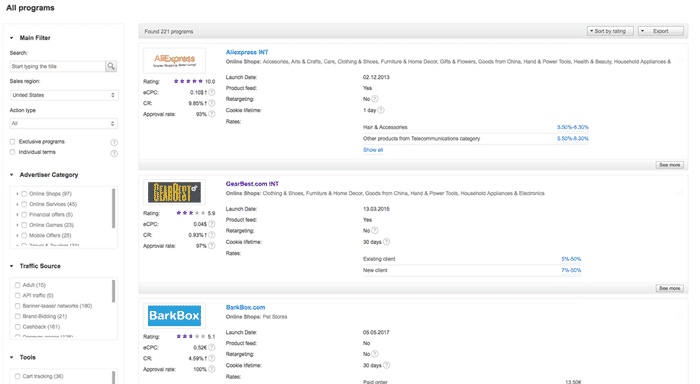 You can sort all the admitad offers according to CPC, CR ratings and choose the best one to promote. I also enjoyed support and help offered by the admitad team. I was able to meet advertisers at the admitad expert – 2017 event which took place on 22nd of September. Isn’t that great for a publisher! admitad helped me in all possible ways that they could. Finally, I was always paid on time by admitad month after month. admitad honestly pays commissions to publishers that they deserve. Driving traffic could be a very daunting task. If you don’t get traffic then you can’t sell even a single product. But admitad tools helped me driving traffic on my offers instantly. I think, not just the tools but the quality of admitad offers also played an important role in driving traffic. Two tools I liked the most. Coupons and Deals – This attracted even more visitors to my site. Cookie Checker – Helped to earn at least 25% more. To be honest, admitad stands out from the rest of the affiliate network that I worked with. I have extensive experience using two other affiliate networks, Commission Junction and Clickbank. So here are some of the differences that I noted. I promoted CJ products for a long time because it was one of the major players in the market at that time. What made admitad different from CJ is its support from entire team. admitad allowed me to talk to advertisers directly and sort things out. However, in CJ there is no direct contact. admitad brings all the three parties publishers, advertisers and the managers at one table. There is no such thing in CJ. I also promoted Clickbank products and one startling difference between these two that I found out was quality of products. Most of the offers/products at Clickbank were junk. However at admitad every offer is of great quality. They are branded products unlike Clickbank. My final word to fellow publishers is don’t waste your time and go ahead with admitad. Their offers are really great and there is an opportunity to make thousands of dollars month after month. If you are able to leverage the power of admitad tools and features then even a new publisher can earn thousands of dollars in no time. One caveat that publishers need to keep in mind is they need a website/blog with some traffic coming onto it otherwise it won’t work. I have been working with Admitad Affiliate Network for more than 1 year now, it is one of the few networks I have successfully worked with to make money online. I would recommend it to any aspiring affiliate marketer. 1) When we click” see more”, we are taken to the next page. In this page on left top is “copy the link” and right side below is “Join”. What should we do first, click “copy the link” or click “Join” first? 2) You have advised beginners like us to start with “Exclusive Programs”. But most of these companies are operating from Russia and few of them even want customers to know some Russian. How can we earn when we hardly have any visitor to our site from Russia? 3) Is it permitted by Admitad and advertisers for us to put these links and banners on our website and promote our website through traffic exchange and rotator sites like easyhits4u and rotate4all. I am new and struggling, with my website 3 months old with hardly any traffic, non-technical guy, 60 years of age, no money to spend for buying fancy autoresponders the benefits of which I do not comprehend(How to use) and determined to succeed in this venture. kindly do reply. 1. What will i do if i dont have a website? 2. How can i get a higher ranking on google SEO? 3. Is there any other PPC sites you recommend in promoting Admitad products. Can you give any suggestion? Hope to hear with you soon. admitad looks great affiliate network….i have been using clickbank for long time but now i should move to admitad after reading this article…great post Pritam..!! pretty well explained and very much understood sir.I really like the way you deliver info with passion and dedication. Just need some instruction and help on one or two things so that i may start off soon. 1.I do not have a website at the stage 2 of sign in,what are my other options and how can I go along. 2.A.when promoting admitad via organic traffic through SEO;please as a newbie,can you delve a little deeper as your an expert. 2.B.as a newbie,suppose I go via promoting admitad offers; please again explain a little deeper. How can i work with this as i do not have any website or URL as you call? Very good information sir thanks for sharing….. I can’t place the CODE onto my WebSite/BLOG. SO that verification can be completed. I am from India and don’t have any web site or blog. still is possible to work with this site and earn? Dear sir, I want to meet you personally and wanted guidance b2b to make money online, if there is any fees or any course by you, that I will pay. At which amount can u withdraw your money? I mani from india and i am really impressed with your subject as i am a youtuber having more than 25000 subscribers but i want to earn money form affiliate marketing so please guide me sir. i m really a great hardworking person and have passion.